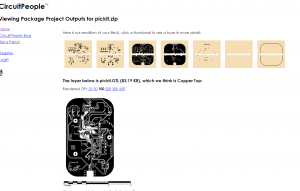 Pickit is the officially supported programmer for Microchip’s PIC line of microcontrollers. 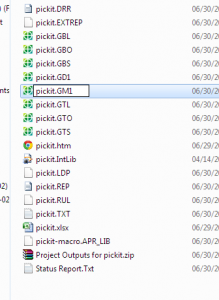 The newest revision, Pickit 3, supports the latest and greatest micros, but does away with some fun stuff like in circuit debugging. 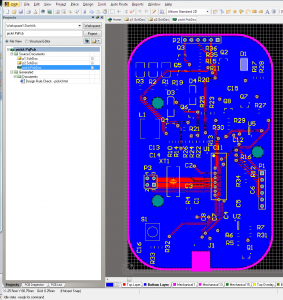 Fortunately, when Microchip dropped support of the Pickit 2, they open sourced the schematic so there are tons of clones out there that have all sorts of different features or design considerations. There are through hole versions, dead-bug versions, versions built with components on hand, and versions built to original standards. I like this one because the official schematic has storage space for programming-on-the-go, which adds a lot of complexity. I have literally never used that functionality on mine, so I’d rather save the weight. All of these components are also easily sourced on the grey market. I’ve checked. They’re cheap. Most clones are through-hole because they’re done on proto boards, but surface mount components are important here for keeping it low-profile. So I’ve redone it in Altium. I’ve add programming headers for the PIC itself and broken out all the spare pins, but otherwise kept it pretty close to the original schematic. I’ve also decided to fit it in the gold standard of hacky enclosure styles: The Altoids tin. It’s kind of surprising that I haven’t seen this done before. Using the Altoids tin dimensions provided by Adafruit, I’ve designed this PCB. The tin will require some cut-outs, but it looks pretty simple. It’s two layers for cost, all components are on one side, and there are fiducial marks for a pick-n-place machine. Basically, I’m trying to make this manufacturable. I have no intention of doing so, but I did it because I could. As usual for most of my projects lately, all files (including Gerbers) are here. Note: The positive rail for the op amp is not connected to the VCC net. Whoops! Blue wire or respin required, if I ever come back to this. This is a pretty rare combo: using a premium PCB package with the budget board house. Generally these small run PCB houses provide DRU and CAM files for EAGLE design rule checking and Gerber outputs, respectively. Because I’m using Altium, I had to make it up as I went along. It gets much easier when you understand what Gerber files are. While we’re all used to standard, unified output formats that contain all of the data we need, Gerbers are very much still a holdover from manufacturing in the 80s. When you export these, a whole bunch of files get generated. This is intimidating, but don’t panic! They all have different extensions like GBO, GTL, etc. These are all the same type of file. As I’ve said, while you’re used to unique file extensions being different formats, these are a holdover from 80s manufacturing and the PCB industry still hasn’t caught up. 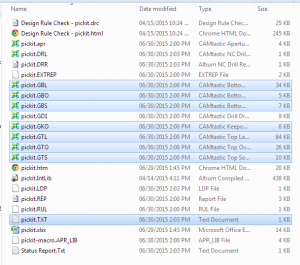 That means that by changing file extensions, you can play around with different layers doing different things. So here’s how you generate the appropriate Gerbers. I used a mostly the default rules for this, I’m not pushing the limits. Maybe next time I’ll generate the proper rule sets. Read and understand these directions before you start. They require some forethought. 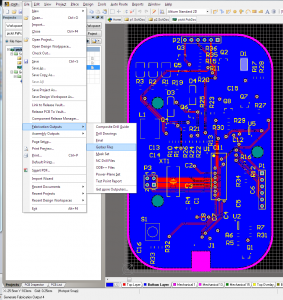 Start out with your finished PCB. The resolution options matter here. There’s no way Dirty PCBs can handle the higher res, so turn it down a notch. In the next tab, this is where you’ll have to do some thinking. Every project is slightly different. So for this one, I want the top overlay (silkscreen), top solder (gaps in solder mask for your pads), and top layer (copper). Same thing for bottom. You also need a board outline. 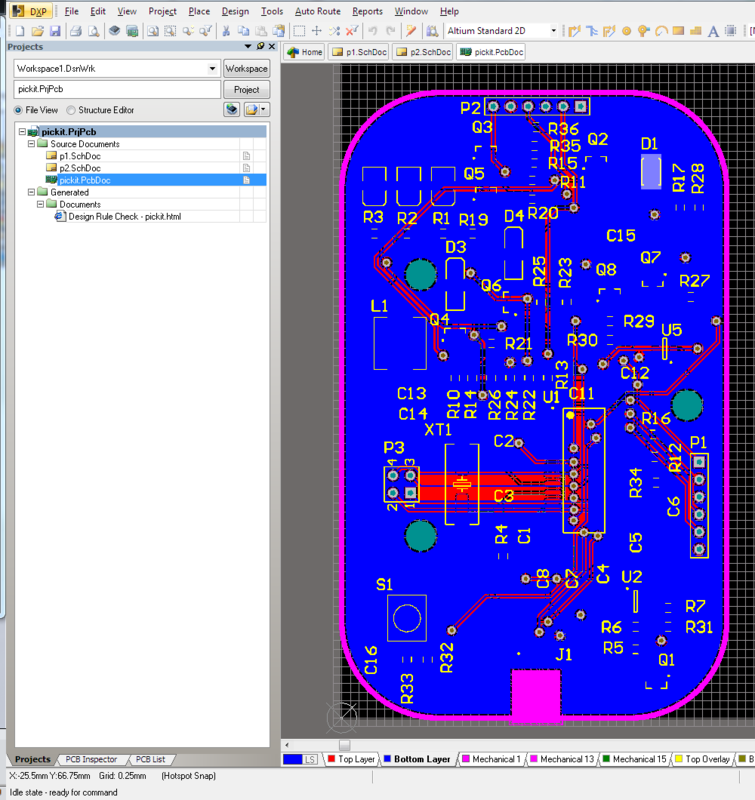 Older versions of Altium don’t have a dedicated “outline” layer, although I believe newer ones do. So what I did was change the board outlines to Mechanical 1, and now I’m exporting that. 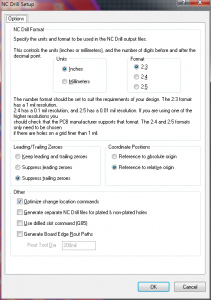 If I wanted to create a solder paste stencil, I would also export the Paste layers. If you want through-hole slots, you will need an additional layer. This includes slots that allow you to panelize. Export them on another mechanical layer, and I’ll talk about it a little later. I’ve done this before, DirtyPCBs does a great job of this. All of the other tabs in this dialog are kept at default values. Don’t mirror the bottom layers as shown. I did that and it was Wrong. I lied a little bit above. Of the exported files, there is one that is not like the others. The drill file (.TXT in this case) requires it’s own export. Do the resolution thing again, and everything else is default. Okay! Now we’ve got all the files we need, let’s make sure they’re in the order they need. 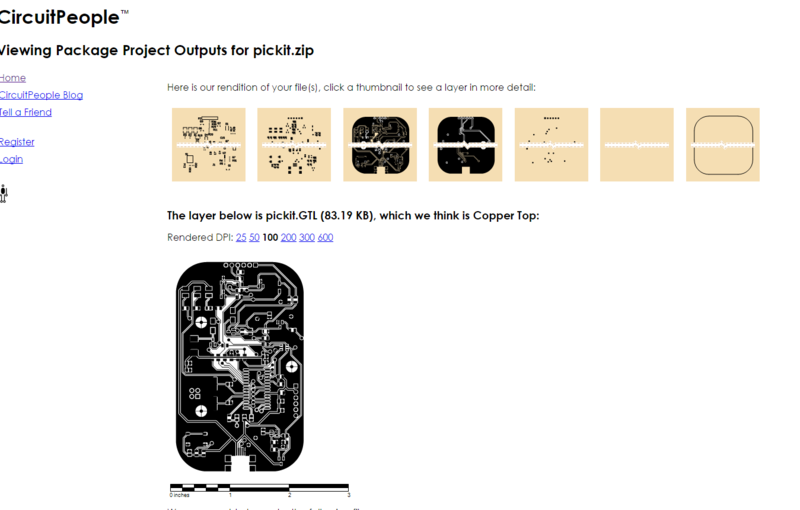 Here’s the key on the DirtyPCBs website. As you can see, it’s super similar to what we have. The top 6 are exactly what we exported, and the drill TXT, too. The outline is the only thing that’s not quite right. 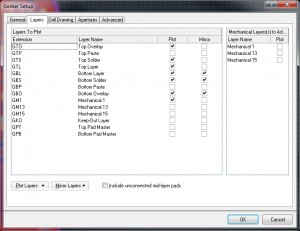 We exported it this time as mechanical layer 1. Easy fix, just rename the GM1 file to GKO. 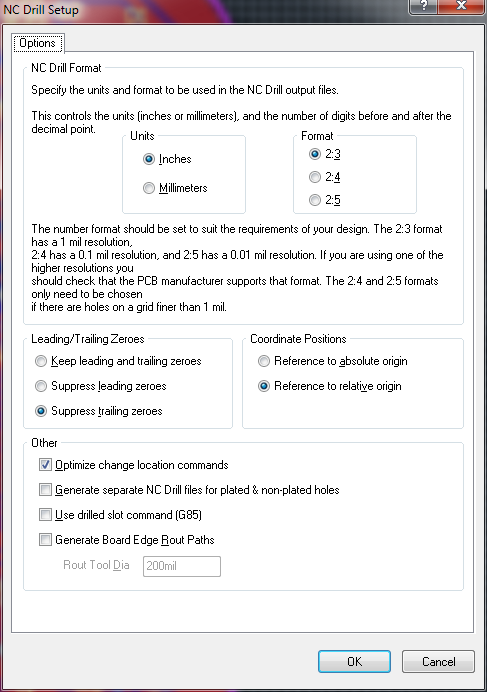 If you’re doing internal slots or self panelizing, you’ll also have exported another mechanical layer. Say, GM2 or GM15 or anything you like. Rename this to GML and include it with the others. And there you go! 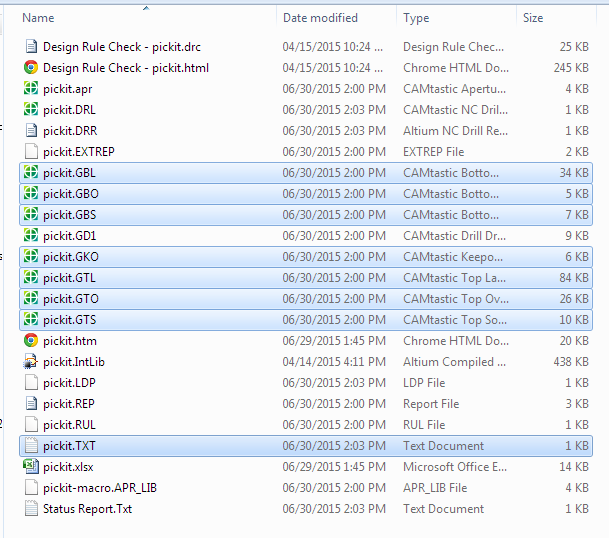 Zip up all of these files, and they should turn out alright. GD1 is the Gerber drill file that this board house doesn’t use, just ignore it. An important step: Check your files. 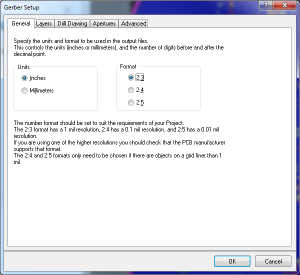 CircuitPeople is an excellent and simple online Gerber viewer. Look at all your layers and make sure nothing is terrible. And you’re done! Send it off and enjoy your boards. If something screws up in the order, I’d like to hear about it, but I take no credit. These steps have always worked for me, but this particular company probably won’t tell you if anything is wrong with the files. They’ll just manufacture it and send it on.